The other day, Katherine O'Brien shared a Pinterest board called "Metastatic Breast Cancer: Stage 4 People and their Stories." I'm not on Pinterest but I clicked through and was floored by all the beautiful and interesting people from so many different walks of life. So many are so young. So many of little kids, as I did when I was first diagnosed. It got me thinking how much connections with others has mattered to me over the last 8 years. I looked back at some of my own lists. I looked at the blogrolls of others. And I realized that far too many of these amazing women are no longer with us. Today's post is not about the sadness and anger I feel when I think about how many wonderful women have been lost to metastatic breast cancer and how little is actually being done to address our needs. Today's post is about our voices. About making a new list of women who are living with metastatic breast cancer and writing about that - and so many other things. Ann Silberman Breast Cancer? But Doctor...I hate pink! Nancy doesn't have metastatic breast cancer and I hope she never joins us but she supported her mother through mets, has been through treatment herself and is a "staunch advocate" for metastatic breast cancer. This isn't the end. For our stories or for this list. I welcome additions from Twitter or the blogosphere. Just let me know. Last winter, there was a bit of shitstorm about whether those of us living with mets had the right to be talking about it publicly. It was aimed at Lisa Bonchek Adams but lots of us took it very personally. For me, it brought a re-newed commitment to keep telling all of my story, including the parts about cancer, as honestly and openly as I can (as Lisa so consistently does, with grace, patience and clarity). I struggled with what to call this post. I personally hate being called a "cancer blogger" because that's not all that I am. 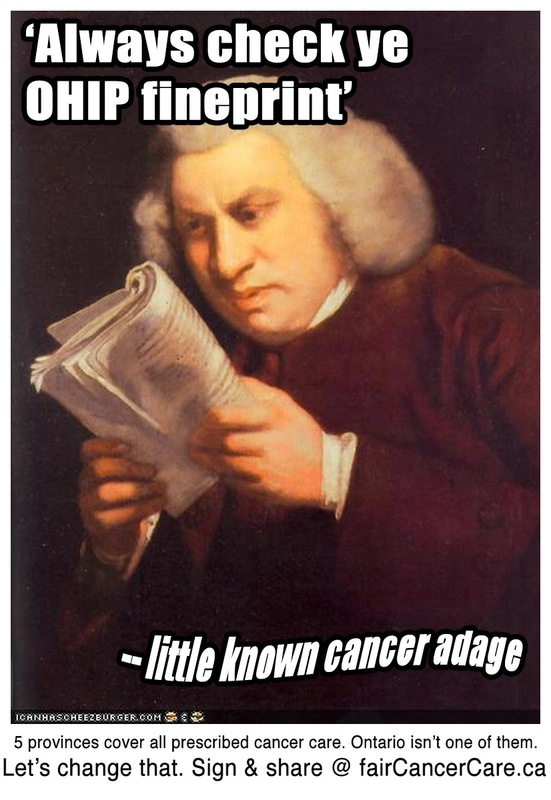 I don't even write about cancer in every post. I settled for the rather unwieldy title, above, because I think that's who we are: women, all different from each other, with interesting lives, who write about living with mets and whatever else is of interest to them. I hope to write more about each of them, in the next few months. Nancy Stordahl is an outspoken breast cancer advocate. She's been through treatment herself and lived through her mother's illness and death from metastatic disease. She started her blog, Nancy's Point, when she was still in treatment and continues to write there today. Nancy is generous with her experience and supportive of others living through breast cancer. Who better, then, to write a guide to conquering the fear of chemotherapy? Getting Past the Fear is full of practical tips, many of which I have never read anywhere else. For example, if I had known that you can get a head cap to fit under your wig "to help keep cooler and minimize itching", I might have actually tried to wear one! And it would have been very helpful to know before my first treatment that it's perfectly OK to unplug the IV (from the wall, not your arm!) and wheel everything to the bathroom. Treatment involves a lot of liquid. No one needs a bladder infection added to their list of chemo side effects. Nancy is very clear that her experience is just that, and that yours might differ and so might your choices. I do think though that most cancer patients will benefit from considering her advice - to keep a journal, ask for help when you need it, do your research and bring your list of questions to appointments with your oncologist. "During that time away, we spent precious moments sitting on our private balcony marveling at the vastness and beauty of the ever-changing water, reveling in leisurely meals...and enjoying each others' company...One afternoon, there was even a brief, lovely wedding ceremony that took place directly below our balcony. The bride and groom and all their guests never once looked up, so they never realized they had two more unannounced wedding guests. Observing an intimate occasion...was a nice reminder of the fact that life was carrying on." If reading all of Getting Past the Fear seems too daunting right now, you can dip in and out. Read the chapter headings and the conclusions in bold that Nancy has inserted at the end of each chapter. Check out the list of questions for your oncologist. Read the parts that speak to you, then stick the book in your purse for when you next need Nancy's advice. She's even left you a few pages at the end to add your own questions and observations. And if digital media is more your thing, download the ebook for your tablet, phone or ereader. That sums up the book's message rather nicely: You will get through this. You are not alone. 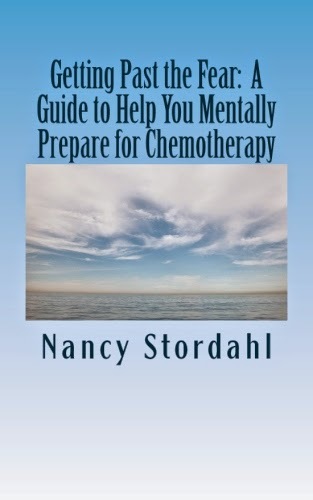 For more information on how to buy Getting Past the Fear: A Guide to Help You Mentally Prepare for Chemotherapy is its various formats, visit Nancy's Point. The blog is also a great resource for anyone facing breast cancer at any stage. Nancy's offered two copies of her book, one ebook and one physical copy. Let me know in the comments, if you would like either. If more than one person is interested, I'll choose recipients at random. The author, with some friends. Update: Would Jo Bucktin and Alene contact me, please? I need to get the info to send you you book! Today's post is a guest post from the Mesothelioma Cancer Alliance. This is the first guest post ever on this blog but I wanted to share this issue and felt it would be best if someone from MCA explained the issue in their own words. 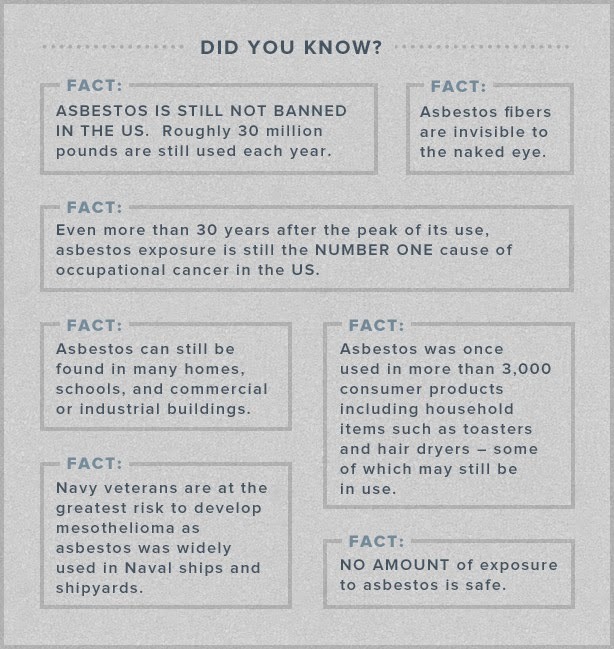 Here are some facts provided by Cameron Von St. James, whose wife Heather is a mesothelioma survivor. Note that while Cameron is in the US and writes about that country, asbestos is not banned in Canada, either (Update: This is the June 16 editorial from the Globe and Mail: "Ottawa's sunny outlook on asbestos is out of step with the facts."). In fact, Canada's Mesothelioma Center says our country's "mesothelioma cancer rate is now one of the highest in the world." Have you ever heard of mesothelioma? Most people have no idea how serious this disease can be unless they’ve been personally affected or have seen the never ending commercials. Mesothelioma is an aggressive form of cancer and unfortunately, the only way to develop this cancer is exposure to asbestos. Sadly, there is no safe level of exposure to asbestos, so any individual who has been exposed has a high risk for developing mesothelioma. • “Asbestos” means inextinguishable in Greek. • Inhaled or ingested broken asbestos fibers may cause an inflammation of internal tissue and disrupt organ function, which leads to the development of mesothelioma. • Asbestos was used extensively in the mid 1900s and is still not banned in the United States today. 30 million pounds of asbestos are still used each year. • Symptoms usually don’t show up for 20 to 60 years after you’ve been exposed to asbestos. • Once diagnosed, mesothelioma patients have many options for treatment. Conventional treatment options for mesothelioma include surgery, radiation and chemotherapy. The Mesothelioma Cancer Alliance has dedicated a significant amount of time in making their site the best resource for patients, families, and individuals who are interested in learning more about the disease. Their mission is to spread awareness in hopes they can prevent this from happening to another family. Asbestos exposure: We’re just at the beginning of a health crisis and a longer piece in the Report on Business, called "No Safe Use" .It's a scathing indictment of the ongoing refusal of the Canadian government to even acknowledge the problem, let alone take measures to protect it's people. I heard on the radio this morning that health care has not been a key issue during this provincial election. I disagree. Maybe the media hasn't picked it up, but health care has been very much on the radar for several groups and the people who support them. The Fair Cancer Care campaign asks that everyone sign a petition and get their candidates to support access to the best chemotherapies regardless of cost or ability to pay. Cancertainty has pulled together more than 40 organizations to get the province to pay for oral chemotherapy. The majority of new chemotherapies will be oral and are not currently paid for by OHIP, as they are not administered in the hospital. Prostate Cancer Canada has been lobbying hard for OHIP to pay for PSA tests, so prostate cancer can be diagnosed and treated earlier. Take measures to shorten the approval times for reimbursement decisions on drugs for metastatic breast cancer patients? Put in place a timely review mechanism for the applications of cancer drugs on compassionate grounds? They only heard back from the Liberals and the Conservatives (who provided a form letter that didn't address the question at all). I'm certain that health care is a major issue for all who live in Ontario, particularly as our population ages. Tomorrow, vote for health care. After the election, let's make sure that equitable access to excellent, high quality health care remains an issue that must be addressed. 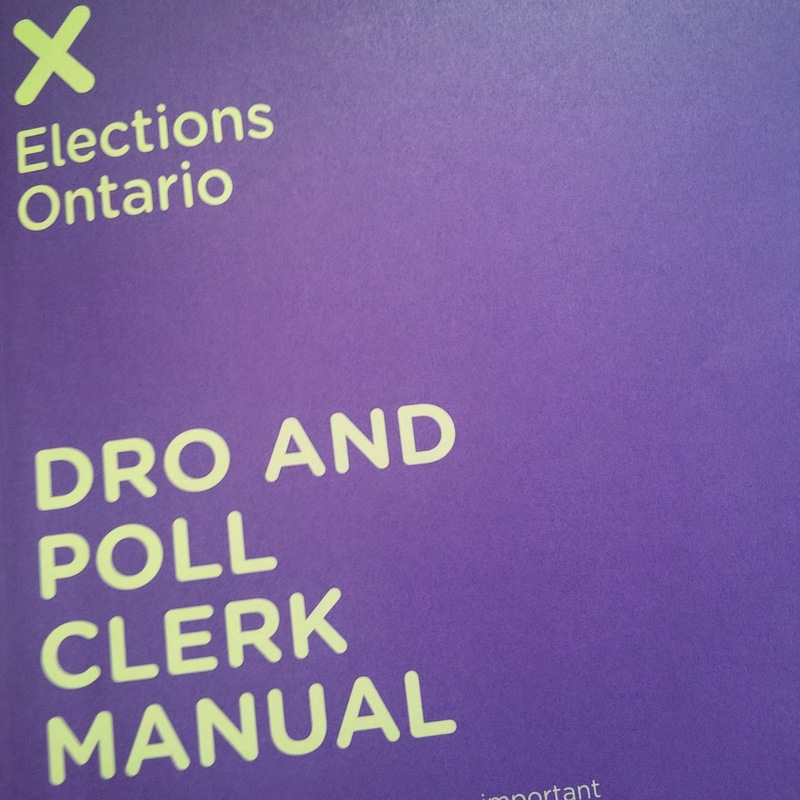 Three years ago, I took a job as a Deputy Returning Officer for Elections Ontario. I'd read a post by Zoom about how she worked during one election and it intrigued me. At that time, I was mostly pushing myself to step outside my comfort zone. Fast forward to June 2014. It turns out that while it feels like much too soon for another election, three years is enough to forget - much like childbirth - the agony of 18 hours of pain, anxiety and boredom. Last week I went to the mandatory training session. It turns out that only some of the candidates and the Returning Office have changed. We were given the same materials, shown the same videos and the training was delivered by the same people. The only difference was that since the last viewing, I have coincidentally met some of the actors (all from Ottawa) used in the video. The Deputy Returning Officer is responsible for setting up the poll, handing out and keeping track of ballots, monitoring the vote and counting the ballots at the end of the evening. There are many, many details involved and quite a bit of responsibility (including determining the validity of ballots at the end of the evening) and yet almost anyone can get hired to do the job. They don't ask for any information from applicants except address, contact information and confirmation that you are over 18. I imagine it's possible that someone from Elections Ontario does a quick background check but that's really it. If you've ever marvelled at the incompetence of election day staff, it's because there is absolutely nothing done to weed anyone out. And they still have a hard time attracting enough people. Part of the problem could be the amount of work relative to the wages. The Information Assistants (the only workers who don't have to be of legal voting age) are paid $13/hour just for greeting people at the door. I worked it out and I think I'll only be getting a few cents more than that. There are no breaks and the whole poll has to close every time I go to the bathroom (I'd better time my bladder to need tending during the quiet hours). The thing I'm the most concerned about is spending the great bulk of my time (14 hours or so) sitting by the Poll Clerk (the person who finds voters on the lists of electors and crosses them off). This person might be perfectly innocuous or even lovely but if not...it makes for an even longer day. Last time, I worked with a university student who was nice enough but kept taking longer and longer "bathroom breaks." At what point do you take someone on about less than acceptable behaviour when you have to keep working with them? You might well be asking yourself why I'm bothering to do this at all. Consider it my contribution to the electoral process. I've complained enough over the years that it feels good to be doing my part. I did enjoy getting glimpses of friends and neighbours on voting day. And, if I'm not too tired to remember anything, it can be great inspiration for writing. Tim thinks that people are so irritated about going to the polls that voter turnout will be low. I worry that voters will show up to the polls and take out the irritation on elections staff. Either way (and even if things go well), I'll likely regret my decision some time during the day. And on June 13 and likely for a few days after that, I plan on being exhausted. As someone living with metastatic breast cancer, I pay keen attention to the development of new cancer drugs. And of course I pay particular attention to the drugs that are likely to one day benefit me. I have been on Herceptin for 7.5 years. My response was rapid and complete and there is no sign that the drug has stopped working. That doesn't mean, however, that I don't worry about the future and how I will proceed once I come to the end of the line with this miracle drug. Enter trastuzumab emtansine, or TDM-1, as it was more commonly known. Over the last couple of years, I watched with great interest as clinical trials occurred all over North America. I have been personally in touch with several women who had as thorough a response to TDM-1 as I did to Herceptin. It was very exciting. Then the trials ended and we had to wait for Health Canada to grant their approval. When that hurdle was cleared, I breathed a sigh of relief. Unfortunately, the sigh was a little premature. The time between Health Canada approval and provincial funding can be long and complicated. Once Health Canada grants its approval, a body called the Pan Oncology Drug Review (pCODR) assesses the drug, a process that can take up to 149 days. After pCODR makes a recommendation, each province decides if it will fund it. And while this is happening, Ontario, unlike some other provinces "...does not have a mechanism in place that would grant cancer patients access on compassionate grounds to a drug that has been approved by Health Canada." I heard last week from the Canadian Breast Cancer Network that TDM-1, now known as Kadcyla, has been approved for funding "for the treatment of patients with HER2-positive, unresectable locally advanced or metastatic breast cancer who have received prior treatment with trastuzumab (Herceptin)and taxane". Phew. CBCN is urging voters to contact "local candidates and ask them their stance on improving access to breast cancer treatments." Improving access to cancer drugs is also a goal of FairCancerCare.ca. If you haven't already signed our petition, please do so today. You can also ask your local candidates to sign our pledge to advocate for fair cancer care in Ontario. This is super easy to do and takes almost no time at all via the website. Meanwhile, I've also heard from CBCN that a drug that crosses the brain-blood barrier is in a phase 2 clinical trial. Will this drug be as effective as it promises to be? Will it be available by the time I need it? I'm holding my breath a little.